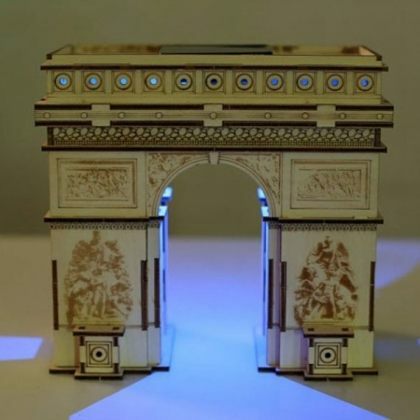 Solar 3D Wooden Puzzle Educational Toy Triumphal Arch in Paris French is a Do-It-Yourself assembling game product that provides a basic understanding of engineering, construction, and solar power energy. 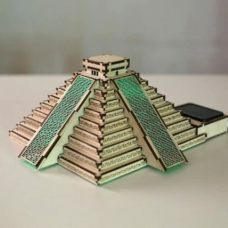 It contains 76 pieces of details made out of environmentally-friendly and non-toxic materials, LED colourful light and solar panel. 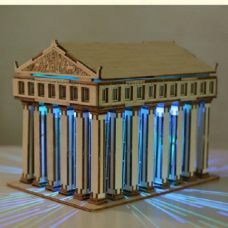 The Solar 3D Puzzle is a smart, fun education for kids and unbelievable creative activity for all family members. 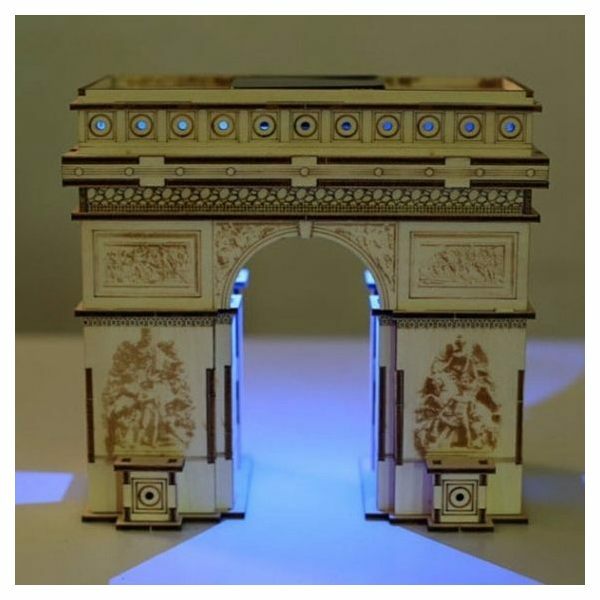 Special Features -Model of Triumphal arch; -DIY model with freely colouring; -Luminous with LED colourful light; -Laser cut nano-engraving puzzle pieces, perfect matching to each other. -Brain and creativity developing toy. Solar 3D Wooden Puzzle Educational Toy is a do-it-yourself (DIY) game product that requires assembling all parts together into a world-famous and unique construction - Triumphal Arch in Paris France. 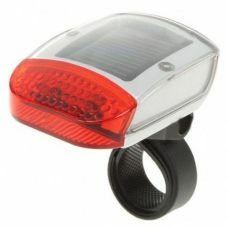 The model contains LED light that powered by Solar Energy and able to glowing in the dark for up to 12 hours when fully charged. 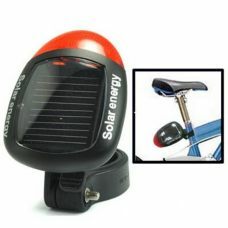 Solar Panel absorbs the sunlight during the day and converts it into the energy that supplies the LED bulb at night. Built-in automatic light sensor switches between On and Off mode so you do not need to do it manually. 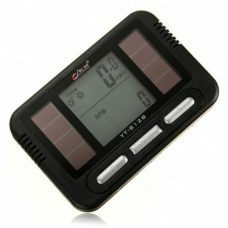 Solar Power system attached to the building model puzzle is straightforward and easy to understand the fundamental processes for kids that make the product extremely valuable for education purposes. 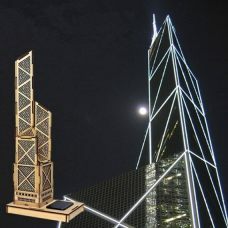 The product contains more than 30 pieces of detail, LED light, solar panel and the process of assembling them require patience, focusing, and concentration. 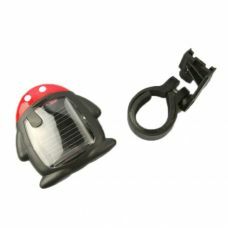 By interacting with Solar Puzzle, children learn the engineering fundamentals while assembling the toy and solar energy basics of converting the sun energy into power to light up an LED bulb. 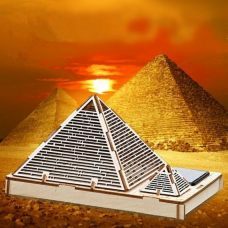 All parts of 3D Solar Puzzle Triumphal Arch made out of wood, are environmentally friendly and non-toxic. 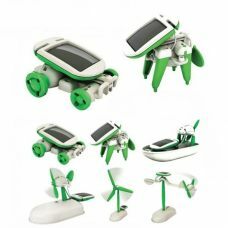 Ideal for: introducing kids to solar power energy technology, developing thinking skill and logic sense, stimulating children brain development and creativity. 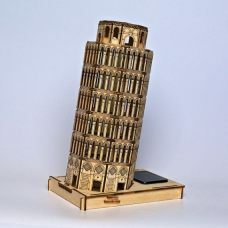 The product also helps to learn about engineering, architecture, world-famous buildings in different countries, and geography in a form of the fun game. 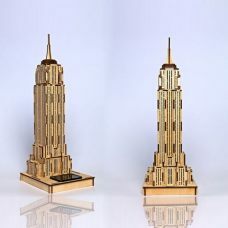 Assembling the 3D Wooden Puzzle is a family entertainment with an active involvement of parents in the educational process. 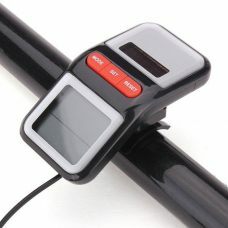 We also recommend the product as a smart gift for a Birthday, Christmas or New Year, or another special event. 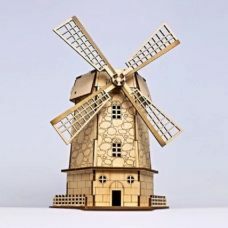 As the model of the building is ready, it might be a perfect household decoration. - Model of Triumphal Arch in Paris France. - The combination of education, fun, and technology. - Developing thinking skill and logic sense of children. - Realistic design of a building and vivid colours. 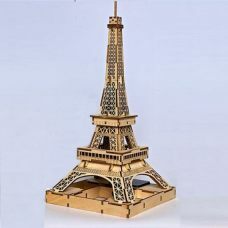 1 x 3D Wooden Puzzle Toy - Triumphal Arch.